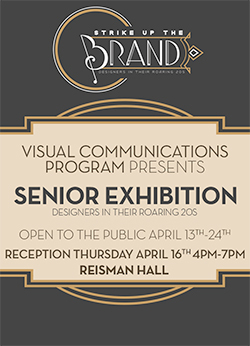 The Visual Communications Program is proud to present the senior exhibition show "Strike up the Brand: Designers in their Roaring 20's." The exhibition will open to the public from April 13-24, 2015, in the Art Gallery in Reisman Hall. The Art Gallery is located at 6 Sullivan Street in Cazenovia. Gallery hours are Monday - Thursday 1 - 4 p.m. and 7 - 9 p.m.; Friday 1 - 4 p.m.; Saturday and Sunday 2 - 6 p.m.
Meet 19 senior designers at the Artist's Reception on Thursday, April 16, 2015 from 4-7 p.m.